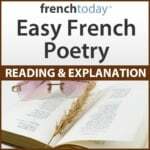 In this classical yet sensual and very musical poem, Valéry describes two people: the “I” who represents the poet and a feminine entity who is approaching. Ghost? Fairy? Or would it be the poet’s muse? How gentle, your cautious steps are! Come to me on those naked feet! And my heart was only your footsteps. Paul Valéry in his costume of French “Académicien”.